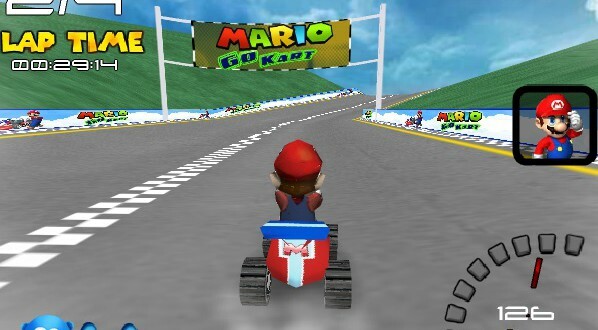 Mario is with his friends on the track and driving karts in this Mario Kart game! There are 3 game modes available to you. At first you can go against the other racers and build your career, then there are single races and eventually you will race against the clock. There are four exciting race tracks to test your ability on. Find out if you're a real racing star or just a humble plumber. The game is played with the arrow keys on the keyboard. At the beginning, you choose your race and as soon as the countdown clock runs down, you click rapidly with the mouse on the line. This ensures that the window is selected and the buttons work. The up arrow accelerates, the left and right arrows steer and the down arrow key applies the brakes. Every now and then you'll find boxes with a question mark on the race track. These always have something good for you. For example, they make you larger, make you fly or give you a higher top speed. Sometimes banana peels lie on the road. You should not go through these as they spin you, losing time. Ramming another driver also causes the kart to lose speed. If you ride without fault from start to finish, you should be able to win all the races. The game is just plain fun. Mario Kart has very good graphics, the music is perhaps a little too stressful for me, but the gameplay is great. It would only be made better if one could go against other real players. If you have played through Mario Kart and just want more, you may feel free to look around our site and discover one of the other Mario racing games there. When you fly, Mario Kart becomes even faster. If you like Mario Kart, please click on the Facebook Like Button. With help of the likes on games, we generate our top 10 charts.